I reckon that some or all of you once in your life tried to imagine your ideal smartphone, or even better, ideal Nokia smartphone. You were preoccupied with thinking of the phones design, screen dimensions, hardware specs, and some special features. I know I did that every year for the past 20 of them since my first handset. It is always interesting to know what the everyday smartphone user fancies about his phone, what is its favorite feature and which one is the preferred among many. This is exactly what Nokia Mobile / HMD wants to hear from you. 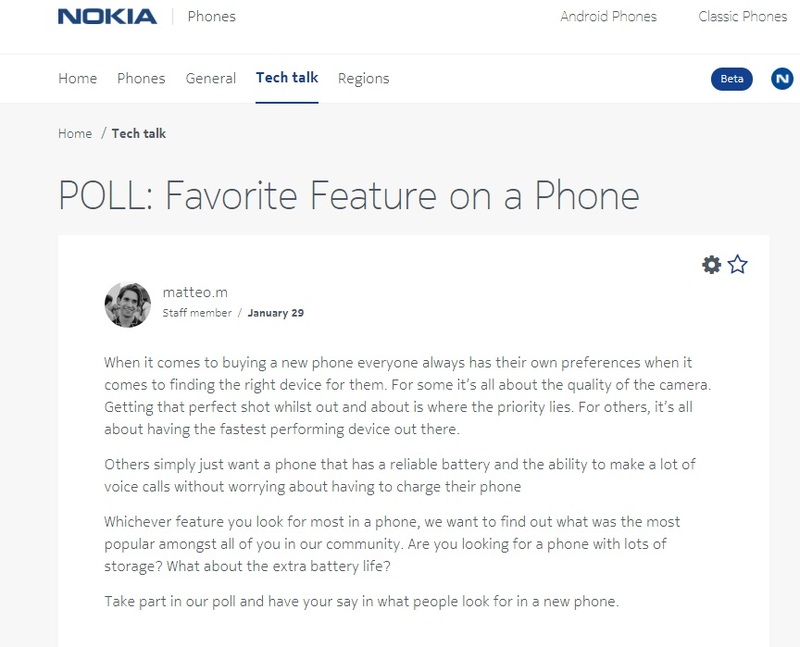 On the Nokia Community Forum, HMD asked members to vote for their favorite phone feature. You can choose between the battery life, design, performance, camera quality, storage, and software. To leave your vote and comment maybe, go to Nokia Community Forum. I’m also eager to know what phone feature do you prefer? I’m all for camera quality. For the past 5 years, I’ve been using my smartphones as the only device to record my life and my surroundings. I don’t even know if my automatic cameras are working. So, great camera quality is something I prefer, but that feature also comes with others like excellent design, hardware performance, and good battery life. The best example for that is Nokia 8, Nokia 8 Sirocco, Nokia 7 Plus, but those are all upper-class smartphones. But, if you don’t want to spend a considerable amount of money on a smartphone, what feature would you prefer then?